This price action indicator automates the detection of trend continuation breakout patterns; formed when price returns to the former key (support or resistance) level and then proceed in the direction of the existing trend. It generates trade signal with analytical entry, stop loss (SL) and take profit levels (TP1 and TP2). The chart pattern recognition is based on a pure price action proprietary algorithm that analyses raw market data. Notifies through sound alert, push notification and email when signal is detected and the stop loss and profit levels are reached. The indicator can be applied to any financial market (currencies, cryptocurrencies, stocks, indices, commodities and bonds) instruments and time frame. Note that for 1 min, 5 mins and 15 mins time frames, scanning will not exceed the beginning of the week (to avoid scanning the weekend market data because of the accuracy that is necessary on these time frames). This indicator detects only high probability chart patterns and also can be used to generate high take profit to stop loss pips trade signals. Does not repaint. Trade signal is not deleted after entry breakout, so that real-time monitoring/trading can be effective. This indicator is suitable for professional and novice traders because it eliminates the time, energy and skill needed for price action trade signal analysis. It provides clean and simple chart pattern display that can easily be monitored/traded profitably. - Bug fixes and general improvement. - Modification to the Pattern strength. - Pattern strength algorithm improvement. - Option to detect formed pattern before its breakout added. - Added the option to determine the minimum number of history bars to always scan. - Improved algorithm in the calculation of strength of detected pattern. - Pattern strength settings added. - ‎Improved take profit and stop loss algorithm. - Improved take profit algorithm. - Improved algorithm so that only high probability patterns are detected. - Bug relating to system resources usage and others fixed. - Added input setting 'Enable System Resources Optimal Scan' to increase or decrease the bars scanned according to the available system resources. - Improved pattern detection algorithm. 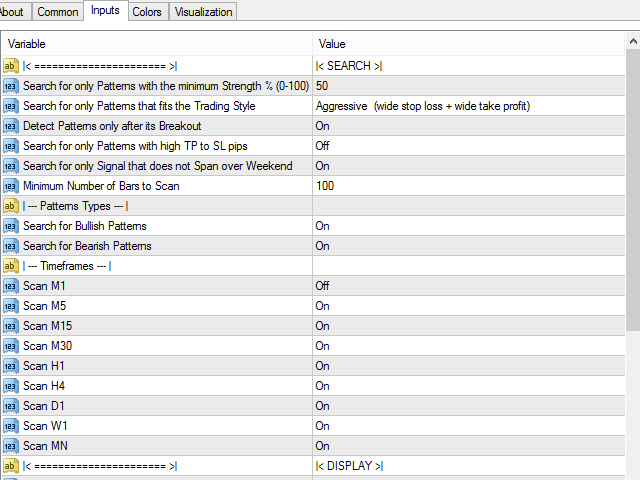 - Added input setting 'Search for only High Probability Breakout Patterns'. - Trading styles(very aggressive, aggressive, conservative or very conservative) can now be selected for appropriate stop loss and take profit levels. - Option to take screenshots for all notifications added. Screenshots will be saved to: MQL4/tester >Files > Retest Breakout Patterns Scanner (in the terminal menu select to view: 'File' -> 'Open Data Folder'). - 'Hide Pattern Illustration' setting changed to 'Show Pattern Illustration'. - 'Show Level Description as List' setting changed to 'Show Level Description on the Level'. - Basic bug fixes and improved overall performance. - Basic bug fixes and improvements. - Added input setting 'Search for only Signal that does not Span over Weekend' with a default value of 'true'. - Comprehensive optimization done to speedup the indicator operation and make it less CPU (processor) intensive. - Improved take profit algorithm to increase signal profitability ratio. - Added input setting 'Search for only High Quality Signal' with a default value of 'false'. - "Hide Pattern Illustration" input settings changed to "Show Pattern Illustration" with a default value of "true". - Improved algorithm and overall performance. - Added the option to display the pattern illustration. - Take profit level algorithm improvement. - Take profit level algorithm modification. - Scanning speed and performance improvement. - Pattern quality algorithm improvement.